Our family farming business is based at Wamuran on the Sunshine Coast in south-east Queensland, in the heart of pineapple country. We’ve been growing pineapples here since founder Geoff Scurr started producing the fruit in the 1960s. With some 1,010 hectares under cultivation around Australia producing three fruit crops, you’ll find our fruit in-store every day of the year. Geoff’s sons, Gavin and Stephen Scurr, and their children grew up planting, picking and packing pineapples on the family farm. Today, our home farm – including pineapple and strawberry fields, packing shed and headquarters – is still in the original district. Gavin and Stephen now operate Piñata Farms from Wamuran, near Brisbane, and Mareeba in Queensland’s far north, where we pioneered large-scale pineapple production in the 1990s. Piñata Farms is now Australia’s largest pineapple producer and the only one to supply fresh pineapples all year. We’re proud to be among Australia’s leading producers of summer and winter strawberries. We also hold the rights to grow specialty Honey Gold mangoes – an Australian favourite – between November and March. We also partner LaManna Premier Group to grow bananas for joint venture company, Darwin Fruit Farm in the Darwin region and, with joint venture partner, BerryWorld Group, produce specialty berries for BerryWorld Australia. Our fruit is grown on our own farms, and farms owned by some 30 third-party family growers spread over five states. They produce pineapples and mangoes under contract for us, and are as dedicated to quality as we are. Continuing the tradition, various members of the Scurr family work throughout the business alongside more than 70 full-time employees and up to 300 seasonal workers. Our pineapple breeding program, run in partnership with Queensland’s Department of Agriculture and Fisheries, investigates the commercial potential of up to 20,000 new varieties each year. Our mango breeding program in South Africa has two prospective varieties growing on some 200 trees. At any one time, we have half a dozen winter strawberry varieties under trial at Wamuran and three summer varieties at Stanthorpe. Piñata Farms is a member of peak business and horticultural bodies including Growcom, Northern Territory Mango Industry Association, Queensland Strawberries, Strawberries Australia and the Pineapple Industry Advisory Committee. Gavin Scurr is a board member and former chairman of the Australian Mango Industry Association (AMIA) and is on the board of the NT Farmers Association. Piñata Farms has 370 hectares of pineapples under cultivation in Wamuran and Mareeba in Queensland, and Darwin in the Northern Territory. The diverse climatic conditions of our pineapple growing regions means that each area has its peak harvesting season. We plant, pick and pack pineapples every day of the year, sending some 800,000 trays to market annually. 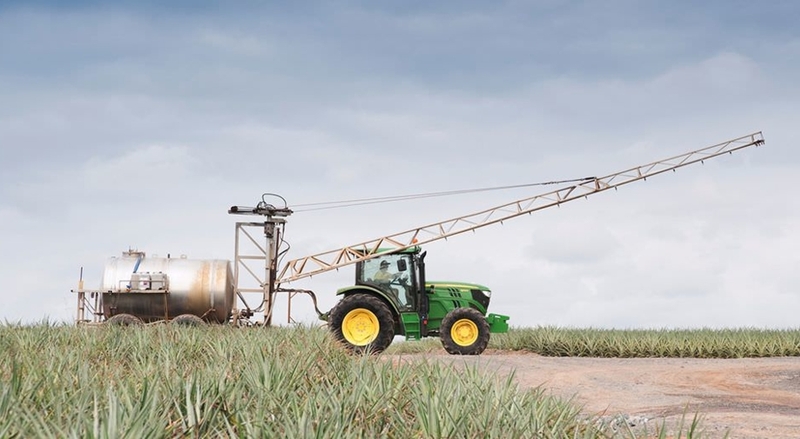 On top of that, we have a third-party grower at Wamuran in Queensland who produces Piñata pineapples – varieties MD2 and 73-50 – chosen for their flavour profile and low acidity. About two million kilograms of second-grade fruit is supplied to factories for juicing every year. Honey Gold mangoes grow on some 170,000 trees on 570 hectares across Australia. We own around half of Australia's Honey Gold farms. Our orchards are at Darwin, Katherine and Mataranka in the Northern Territory. The rest are owned by contracted family farmers at Katherine in the Northern Territory; Mareeba, Bowen, Yeppoon, Rockhampton, Gladstone, Bundaberg, Mundubbera and Caboolture in Queensland; Byron Bay and Coffs Harbour in New South Wales; Mildura in Victoria; and Kununurra and Carnarvon in Western Australia. We supply mangoes between November and March. Our strawberries – including BerryWorld specialty strawberries – are produced on 70 hectares at Wamuran and Stanthorpe, Queensland. Our Wamuran farm produces the winter crop while our Stanthorpe farm – set in one of Queensland’s coldest regions – produces the summer crop. Annually, we send up to seven million punnets of strawberries to our supermarket customers in Queensland, New South Wales and Victoria. We work hard to match great-tasting varieties with our distinct growing regions. Current varieties include Albion, Festival, Fortuna, Red Rhapsody, Scarlet Rose and Sundrench. Development begins on a new specialty berry farm near Orielton, Tasmania, for production in 2020. Piñata Farms and Gavin Scurr lead the commentary for Queensland strawberry growers following a national contamination crisis. Piñata strawberries remain on shelves as the community rallies for growers. BerryWorld Australia launches its first commercial crop of specialty raspberries grown at Stanthorpe, Queensland. BerryWorld Australia – a joint venture between global berry breeder and marketing company, BerryWorld Group and Piñata Farms – sends its first specialty strawberries to market. Strawberries are grown in raised table beds at Wamuran and Stanthorpe. Polytunnels are trialed for strawberries at Stanthorpe, Queensland. The first Top End-grown pineapples are harvested in Darwin, Northern Territory. Night picking and the industry’s first custom-made mango harvesting aids are introduced at Katherine, Northern Territory. Strawberry production at Stanthorpe, Queensland, signals the start of year-round production. Honey Gold mangoes account for eight per cent of the Australian mango market. About 3,500 Honey Gold mango trees at Rockhampton are lost to flood. Another 3,000 replacement trees are lost in the 2013 flood. The original Honey Gold tree survives both events. Piñata Marketing is rebranded. Piñata Farms is born. The first commercial crop of Honey Gold mangoes goes to market. A pineapple-breeding programme is established with Queensland's (then) Department of Primary Industries. Piñata buys the breeding rights to grow Honey Gold mangoes, the product of a Kensington Pride off-type bred in Rockhampton, Queensland, in 1991. Stephen Scurr moves to Mareeba, North Queensland, to run Piñata’s northern operations. Strawberries are identified as a new crop. Winter production begins on 32 hectares at Wamuran. Piñata Marketing becomes Australia's largest pineapple grower, sending fresh fruit to market year 'round. The first commercial crop of Mareeba Gold pineapples is sent to market. The Scurr brothers introduce Hawaii's hybrid pineapple variety MD2 to Australia, branding it Mareeba Gold. Gavin and Stephen Scurr create Piñata Marketing as a separate packing and marketing division. Geoff Scurr establishes the Scurr family pineapple farm, "Whispering Pines", on 26 hectares at Wamuran, Queensland.